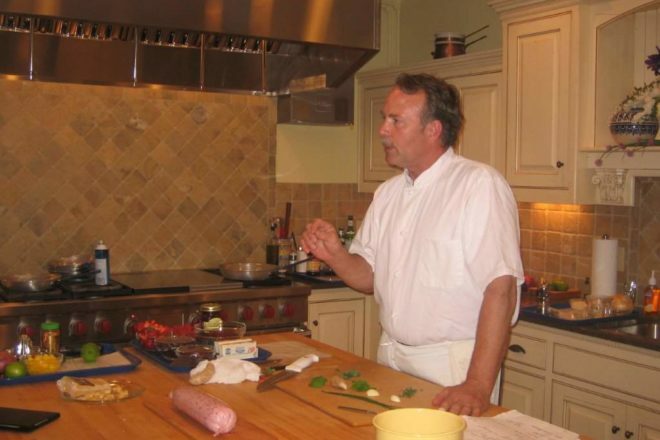 Mike Mead teaches a class at Savory Spoon. Submitted. Mike Mead, executive chef at Shoreline Restaurant, will be the featured guest chef at Savory Spoon Cooking School on Sept. 28 at 6 pm. Mead, chef/owner of the Shoreline Restaurant for 21 years, has a passion for whitefish and mussels and his favorites will be featured in this class. The menu includes whitefish dip on handmade pita; salad of spring greens with prosciutto and warm balsamic dressing; toasted pine nuts and Parmesan cheese; Door County whitefish chowder with warm baguettes; orange-basil mussels with fresh pasta and sour dough toast points; and stuffed mussels a la Shoreline. The cost of this class is $75 per person. Savory Spoon will then host a class Sept. 30 at 6 pm featuring Mediterranean cuisine. Greece is the cradle of Mediterranean cuisine, a place that embraces cooking and eating with a passion for pure ingredients like olive oil and flavorful herbs. This class will celebrate the bold sun-drenched flavors of Greece. Fabled Feta will be tasted and you can decide which brand is your favorite. The menu includes: a classic Greek salad; peppers stuffed with feta; dolmades; Greek lasagna (pastitsio); feta tart; and orange yogurt cake. The cost of this class is $65 per person. To register or for more information, visit savoryspoon.com or call 920.854.6600.